I think it looks awesome, especially the Sara/T-Bag showdown. But I'm not too thrilled with the whole "evil mom we all thought was dead" storyline. However it's much better than the "brain tumor" soap opera-esque storyline. Truthfully, I'm getting kinda sad that I won't get to see these guys every week. But at least I have Fox's new show, FRINGE, to ease the pain - I absolutely adore Walter! It's raining men - woot! Like them tall? Dark? Rugged? 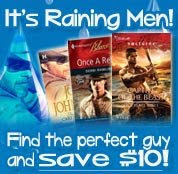 They're all up for grabs in our eHarlequin's It's Raining Men sale. Just find your perfect guy and you'll get $10 worth of FREE books. Shop now. This month only, spend $10 or more on any books and you'll get FREE shipping—start shopping now!